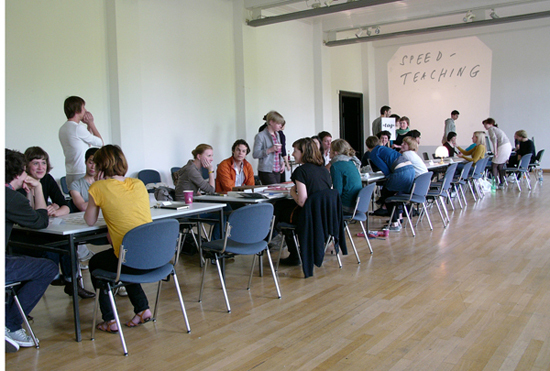 As part of my teaching engagement at the Leipzig Academy of Visual Arts, we devised a Speed-Teaching event for the 1st years. 11 of my students (3rd, 4th, 5th years) were teaching, informing, coaching 1st year students, individually and face-to-face in 5 minute seat-hopping intervalls: about genuinely useful aspects of design, the movers and shakers in the college, local suppliers, micro-typography, recommended key texts or books etc. Accumulated student knowledge distributed directly to students. A small brochure, whose spreads were gathered in the course of one's journey through the different positions, contains the collected insights.